Authorities investigating Aaron Hernandez for the 2012 double-murder on which he was indicted last week have put out a public call for help: They're looking to speak with tattoo artists who did work on Hernandez's right forearm, reportedly under the belief that Hernandez may have gotten some ink to commemorate his role in the shooting. 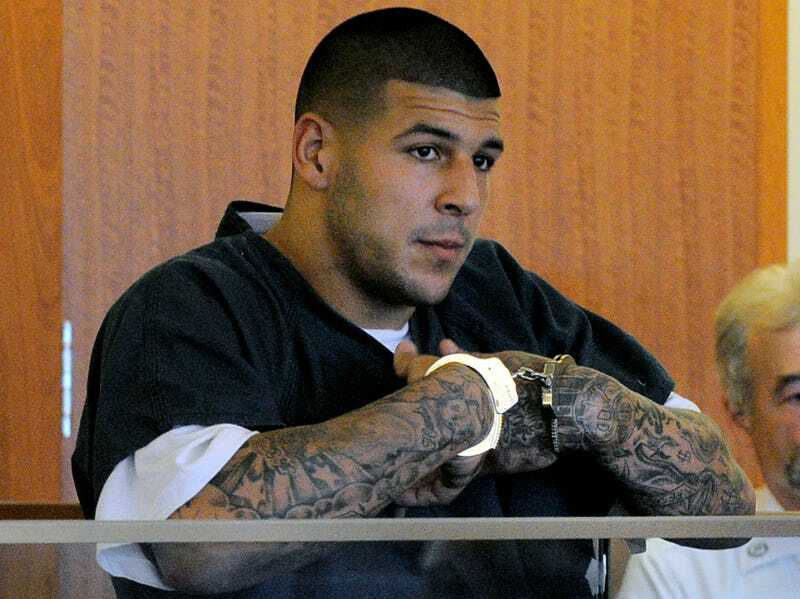 Investigators are seeking to speak with any tattoo artists who provided Hernandez with specific tattoos on his right forearm between February 2012 and June 2013 as witnesses in the ongoing homicide case, according to the Suffolk County District Attorney's Office. During that time Hernandez is known to have traveled to Hermosa Beach, Calif.; Bristol, Conn.; Palm Beach and Miami, Fla; Boston and Rhode Island, but prosecutors are open to speaking with anyone who tattooed Hernandez' right forearm during those 17 months. The D.A. 's offense doesn't give detail on what it's looking for, but TMZ surmises that Hernandez's may have specific tattoos memorializing the drive-by shootings of Daniel Abreu and Safiro Furtado on July 16, 2012—the less-obvious equivalent of a teardrop tattoo, as it were. Hernandez's right arm is more or less sleeved, so it's tough to pick out anything specific. Maybe you'll have better luck.